One of the nation's oldest teaching hospitals, this 816-bed facility -- located in downtown Baltimore -- is home to the University of Maryland Marlene and Stewart Greenebaum Cancer Center, the R Adams Cowley Shock Trauma Center, the University of Maryland Children's Hospital and the University of Maryland Division of Transplantation. This 208-bed teaching hospital offers a full spectrum of health care for more than 110,000 people annually. University of Maryland Medical Center Midtown Campus has been providing superior and accessible community health care in West Baltimore and Midtown for more than a century. This 102-bed pediatric and rehabilitation hospital, located in northwest Baltimore, provides specialty medical care to infants and children with complex medical needs. UM Baltimore Washington Medical Center (UM BWMC) is a 310-bed comprehensive medical center caring for families in and around the Baltimore Washington corridor. It provides a range of services and centers of excellence that include the Aiello Breast Center, Pascal Women's Center, Tate Cancer Center, Maryland Vascular Center, emergency care, pediatric care, psychiatric care, Joint Replacement Center, Baltimore Washington Spine and Neuroscience Center, Wound Healing and Hyperbaric Medicine Center, University of Maryland Center for Diabetes and Endocrinology, cardiology and cardiac rehabilitation services, endoscopy services and geriatric services. BWMC is also a Primary Stroke Center. Located in La Plata, Maryland, this 121-bed community hospital, along with an Ambulatory Surgery Center and OB/GYN Centers in Waldorf and La Plata, serve patients in Charles County and the surrounding areas of southern Maryland. 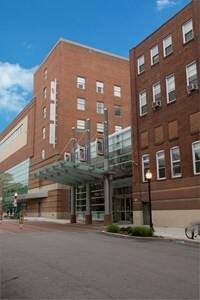 This 144-bed facility (formerly Kernan Hospital), located in Woodlawn, is the state's largest rehabilitation and orthopaedic hospital serving both adults and children. It also houses the University of Maryland Complementary Medicine Program. This 232-bed nonprofit, regional medical center, located in Towson, Md., became a part of the University of Maryland Medical System on December 1, 2012. It features institutes for heart, cancer and orthopaedic care, and offers a full range of clinical diagnostic and treatment services. Shore Health System became UM Shore Regional Health on July 1, 2013, and consists of the following facilities: UM Shore Medical Center at Chestertown (41 beds); UM Shore Medical Center at Dorchester (41 beds)and UM Shore Medical Center at Easton (132 beds), as well as the UM Shore Emergency Center at Queenstown. In December of 2013, Upper Chesapeake Health became the University of Maryland Upper Chesapeake Health System. It consists of the University of Maryland Upper Chesapeake Medical Center in Bel Air and University of Maryland Harford Memorial Hospital in Havre de Grace. The leading health care system and largest private employer in Harford County, UM Upper Chesapeake Health offers a broad range of healthcare services, technology, and facilities to the residents of northeastern Maryland.